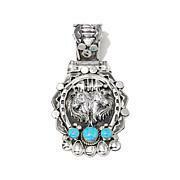 Cherish the rich tradition of authentic Southwest jewelry with this handcrafted Kingman turquoise feather pendant — made in America. Slip it on your favorite chain, rope or ribbon and wear it proudly. You really have to feel these pieces to appreciate how beautiful they are. The pictures cant capture it. They are weighty and very well made. The stones always compliment the pieces. Im addicted at this point and I have a long wish list. 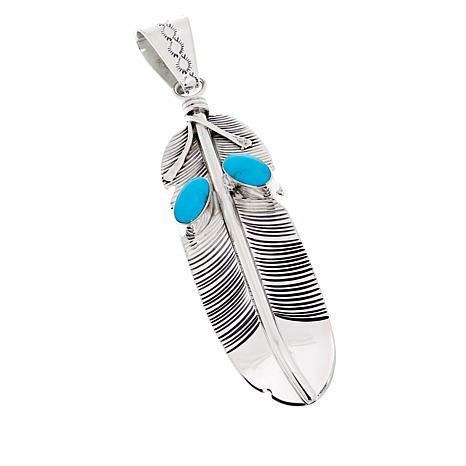 When I wear this feather pendant I have always received several nice comments. Love this beautiful large pendant! I have many Chaco Canyan pieces and hope to have many more. The silver is substantial and georgeous. Love that they are all made in America by wonderfully talented Native Americans. For some reason there was no certificate of authenticity in the box this time and no Chaco Canyun markings on the outside of the box, which was disappointing. 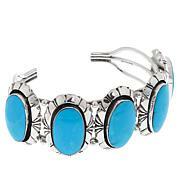 Love the beautiful jewelry and hope to purchase many more pieces in the future! A lovely handcrafted silver pendant. If you like feathers, this is the one. 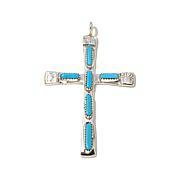 Gorgeous on a liquid silver chain, and the turquoise is beautiful.